One of our favorite parts of this business has always been designing a new piece of jewelry, either with new stones or with exciting ones, or sometimes both! 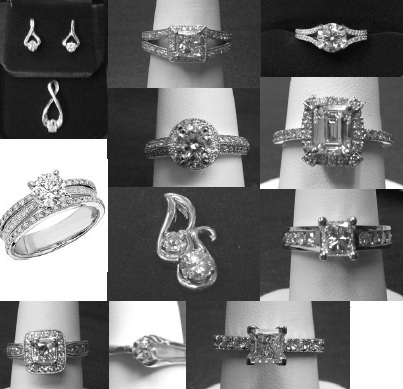 The following are new pieces that incorporated style, past and present, that matched the customer's personal tastes. To the right is an example of an idea that became a sketch, a rendering (top) and the final product (ring at the bottom.) Fashioned after a a set of her grandmother's, this customer incorporated her grandmother's design and memories with her own elegant style.